Human oocyte cryopreservation has undergone rapid growth, with technical improvement and increasing clinical application over the last ten years. Storing eggs is ethical and gives many young women their most realistic chance of conception. Cryopreservation, however, is still considered by many as an experimental technique and conflicting reports are published as to its efficacy. For these reasons, it is necessary to give reproductive researchers and practitioners comprehensive and systematic information about the field. This book describes and analyses the history of human oocyte freezing, the main steps of technical evolution, and the pros and cons of different techniques. In addition, the clinical applications, long-term outcome, efficiency and safety of oocyte cryopreservation are detailed. 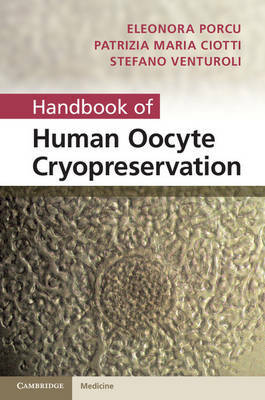 The Handbook of Human Oocyte Cryopreservation gives a complete picture of the field today and is a valuable text for embryologists, cryobiologists, reproductive medicine practitioners and anyone involved in researching and implementing the technique.